» To Celebrate Earth Day Make the Most Out of Your Sunkist Citrus Fruits! Home » Life	» To Celebrate Earth Day Make the Most Out of Your Sunkist Citrus Fruits! To Celebrate Earth Day Make the Most Out of Your Sunkist Citrus Fruits! Sometimes it is overwhelming to read about all the things you should be doing differently to become more sustainable and create less waste. Well, here’s a realistic and cost-saving way to tackle just that – Citrus fruits, don’t just eat them! Use the peel, add it to household cleaners, add zest to your salad, garnish your cocktail, make decorative fruit wheels and the list is never-ending. Whether you’re zesting, peeling, or juicing, Sunkist offers ups some useful tips on how you can get the most of your citrus for use in household cleaning or DIY beauty concoctions. In other words, you can help make this world a more sustainable one just by starting to use the whole fruit! Take the lemon – nature’s clean machine; not only are they wonderful in recipes, but they’re also great all-natural cleaners. 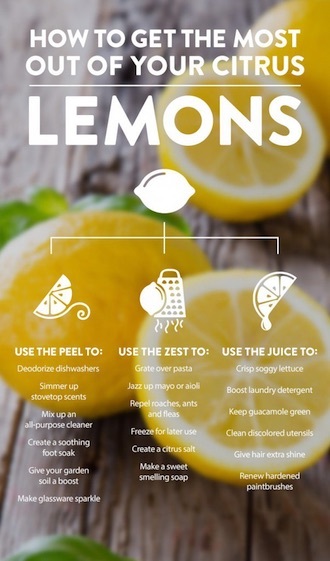 Here are just a few of the uses for lemons around the home. 1. A bowl of lemons, naturally floral in fragrance, will liven up any space. 2. Rub your hands with a wedge of lemon to get rid of lingering odors, grease, and oil. As an added benefit, it will also keep your hands soft and smooth. 3. Fresh lemon juice can clean copper pots, pans, and bowls. A salt and lemon paste can remove oxidation and is environmentally friendly. 4. Leftover lemon peels can be used to fertilize roses or other plants that need extra acidity. 5. Boil fresh lemon juice or sliced lemons and water in an aluminum pot or kettle to remove discoloration. You can also clean pots with a cloth dipped in lemon juice, then rinse them in warm water. 6. To make glass sparkle like new, rub it with cut lemon or soak it in lemon juice and water. Rinse well, then dry with a lint-free cloth. This works especially well on glass decanters and coffee pots. 7. Put lemon peels in the fireplace for a lovely fragrance when the fire is lit. 8. To remove odors from cutting boards, rub them with half a lemon, then rinse well and dry. 9. Keep your garbage disposal smelling fresh by grinding up lemon peels after juicing. 10. To remove stains from clothes, mix 1/3 cup lemon juice with water. 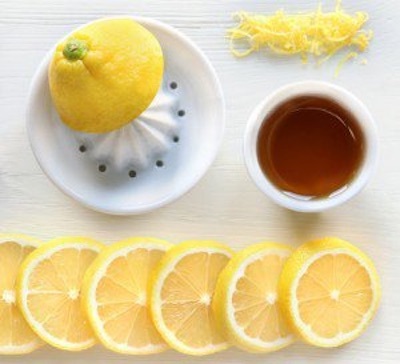 Soak the stain, then wash.
And of course, let’s not forget about pampering your skin with lemons! Sunkist Lemon Almond Scrub is a soothing, easy to make exfoliator that will leave your skin feeling clean, refreshed and invigorated. Directions: In a coffee grinder or food processor, grind together the almonds and the Sunkist lemon zest. In a small bowl, combine the mixture with lemon juice and honey until it forms a grainy cream. To use, apply the mixture to your face, massaging in a circular motion to lift and remove all of the dirt and exfoliate the skin. Rinse with warm water. Your skin will be smooth with a fresh citrus scent.